We should all be worried about roads. Why? At the outset, roads — especially those that slice into native ecosystems or wilderness areas — often open a Pandora’s Box of environmental problems. In the Congo Basin, for instance, loggers have bulldozed over 50,000 kilometers of new roads since 2000, leading to an epic carnage of forest elephants for their valuable ivory tusks. Two-thirds of all forest elephants have been slaughtered by poachers in the last decade. In the Peruvian Amazon, new highways are opening up forests to large-scale deforestation and invasions of tens of thousands of illegal gold miners, who have polluted rivers with toxic mercury and turned vast areas of forest into virtual moonscapes. Beyond this, we are living in the most dramatic era of road expansion in human history. The International Energy Agency projects that we will have some 25 million kilometers of new paved roads by 2050 — enough to circle the Earth over 600 times. Nine-tenths of these new roads will be built in developing nations, including many tropical and subtropical regions that sustain the planet’s biologically richest and most environmentally important ecosystems. And that is hugely worrying because, largely as a result of road-driven habitat fragmentation, 70 percent of the planet’s forests already occur within 1 kilometer of an edge or clearing. How much worse will it be when roads have cut deep into most of the world’s surviving wildernesses? To help protect nature, an urgent priority is to learn where roads actually occur on the Earth. This might sound like a simple task but it isn’t. Many roads are constructed illegally, by loggers, miners, illicit-drug producers, and others seeking access to forest resources, often in remote frontier areas with little environmental monitoring. In the Brazilian Amazon, for example, a recent study by ALERT’s Bill Laurance and colleagues found nearly three kilometers of illegal roads for every one kilometer of legal road. And once all these illegal roads are mapped, the overall impact of roads on forests became clear: 95 percent of all Amazon deforestation occurs within 5.5 kilometers of a legal or illegal road. 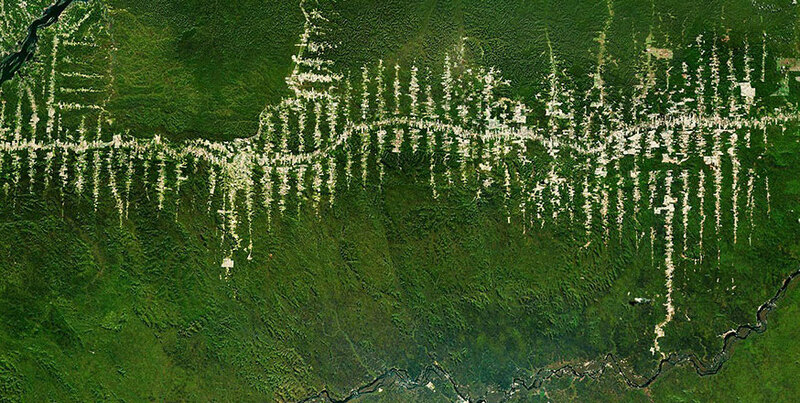 This shows that roads are having a remarkably powerful impact on the pattern and pace of forest destruction. In response to the dire need for better road maps, the European Commission’s Joint Research Center in Italy is undertaking a groundbreaking project to map all the legal and illegal roads across the world’s tropical and subtropical forests. Known as RoadLess, this effort will combine high-resolution satellite imagery with crowdsourcing — using volunteers and some paid workers to map roads by hand. Humans, it turns out, are very good at discriminating patterns and objects in visually ‘noisy’ backgrounds — easily exceeding the capacity of computers to do so accurately. The leaders of the RoadLess initiative, researchers Steve Peedell and Frédéric Achard, are beginning to recruit volunteers and others interested in this innovative program. The data this project produces will be invaluable — for studying how roads impact forests and wildlife, for proactively planning roads, for identifying wilderness areas, and for detecting illegal activities. This information will feed directly into a range of domestic and international initiatives to enforce environmental laws, to better plan and manage roads, and to use carbon trading to promote forest conservation. The RoadLess initiative is incredibly timely, and the European Parliament must be congratulated for initiating and funding such an urgently needed task. There is simply no time to lose. From Africa to the Amazon and the Asia-Pacific, unbridled road expansion is having an alarming impact on vanishing wildlife and wild areas. Mapping and managing roads and their myriad environmental impacts is probably our greatest single challenge for conserving the last vestiges of nature.